Currently Unavailable. Please call 866.949.9269 to request product backorder status. Quiet Barrier™ Class A Specialty Composite is a four layer soundproofing composite used in construction, automotive, heavy machinery and marine industries to reduce noise transfer from structural borne and airborne sources. Quiet Barrier™ Class A Specialty Composite was engineered for applications where extreme noise is problematic and heat resistance is required. Quiet Barrier™ Class A Specialty Composite has an intricate four layer construction, making it our premium barrier and acoustic foam soundproofing composite. The first layer is a fiber reinforced Mylar® facing that blocks high frequency sound, resists heat, resists tearing and can be wiped clean. 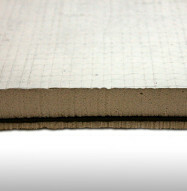 The second layer is a thick Class A acoustic foam that absorbs low, mid and high frequencies. The third layer is our Quiet Barrier™ MD product that blocks sound energy. 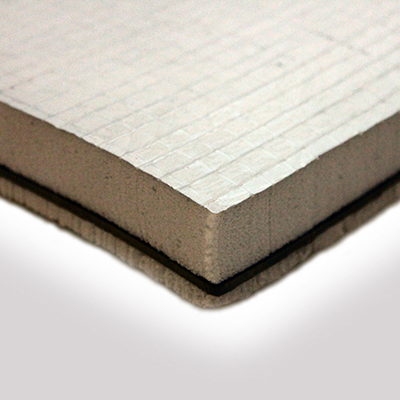 The fourth layer is a thin layer of Class A acoustic foam that suspends the barrier layer away from the mounting surface. This layer structurally isolates the barrier layer, improving the sound blocking capabilities. Dimensions 4 ft. x 4 ft. Triple Soundproofing Function — The mass of the Quiet Barrier™ layer blocks sound while its flexible nature dampens sound energy. 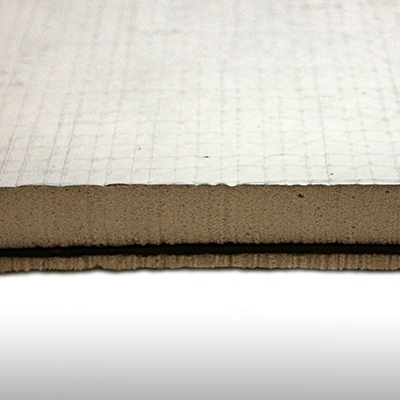 The thicker of the two layers of Acoustic foam acts as a sound absorber, decreasing ambient reflected noise. The thinner layer of acoustic foam acts as a decoupler, structurally isolating the heavy barrier layer from the construction assembly, ultimately decreasing vibration and increasing the sound blocking performance. Heat Resistant — Quiet Barrier™ Class A Specialty Composite has a fiber reinforced Mylar® facing that not only reflects high frequencies but also reflects heat back towards the source. This product is our best performing sound blocking material in exposed locations with above average temperatures. Durable — The Mylar® facing provides a cleanable, tear resistant surface for applications that may come in contact with oils or grease. Once punctured, the embedded fibers will prevent additional tearing or damage. The acoustic foam and barrier layers are thermally bonded, providing a much stronger, longer lasting bond over traditional adhesives. Low Profile — Quiet Barrier™ Class A Specialty Composite has a thickness of 1 1/4 inch, saving valuable square footage. Quiet Barrier™ Class A Specialty Composite is used in many equipment enclosures where space is tight. Ease of Installation — Quiet Barrier™ Class A soundproofing composite is available with an optional “peel and stick” pressure sensitive adhesive (PSA). Simply peel the silicone coated paper backing and place the product where it is needed. In-stock — We stock a large amount of Quiet Barrier™ Class A Specialty Composite in all advertised sizes and configurations. Most products are shipped the same day they are ordered and arrive at your project in three business days. Customization — We will create a custom Quiet Barrier™ Class A Specialty Composite for your application. Custom profiles, shapes and sizes can be quoted upon request. For custom Quiet Barrier™ Class A Specialty Composites there are minimum order quantities, please contact our Acoustic Consultants for more information! Flammability — Quiet Barrier™ Class A Specialty Composite has a Class A flammability rating in accordance with ASTM E 84. This product passes building codes that have strict flammability requirements for exposed materials. In essence, Quiet Barrier™Class A Specialty Composite products block the transmission of noise from one area to the next. The sound from the “noise source” hits the Mylar® facing and high frequencies are reflected back towards the noise source. Some of the sound is then absorbed by the acoustic foam. 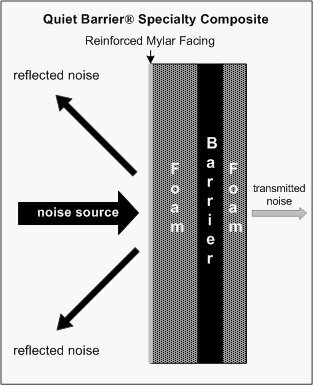 The sound that penetrates the acoustic foam layer is then blocked by the decoupled barrier layer and reflected back into the room or space of origin. See figure 1. The difference between the source noise and the transmitted noise is the sound transmission loss.